Camp Applegate is a series of fun activities that are done around the house as a family. These activities are spontaneous, fun and have little or no cost. The things we cherish most are the life experiences we share as a family. These adventures create the lasting memories and open up opportunities for great communication and fun together. I hope you enjoy our craziness and find some fun adventures that you can do with your family. “Family Night At The Ditch” has become one of our summer time favorites. It sounds like an episode from Hillbilly Heaven. In this manicured gated community there is a drainage ditch that runs through the middle of the neighborhood. The streets cross over large culverts. Cars traveling over these culverts never considering the life that lives below. When the sun goes down the ditch comes alive with singing crickets, croaking bullfrogs and slithering snakes. We maintain one of every size rubber boot for whoever is over to join in the adventure, pile into the Suburban with spot lights, and head for the ditch. We head down the hill and into the culvert looking for the returning glow from the eyes of the big bull frogs. Typically they are lined up along the creeks edge looking for a meal. We spot one laying in the grass and the excitement builds. All carefully but swiftly converge on the unsuspecting bullfrog. One holds the spotlight in their eyes and one of the kids go in for the grab. 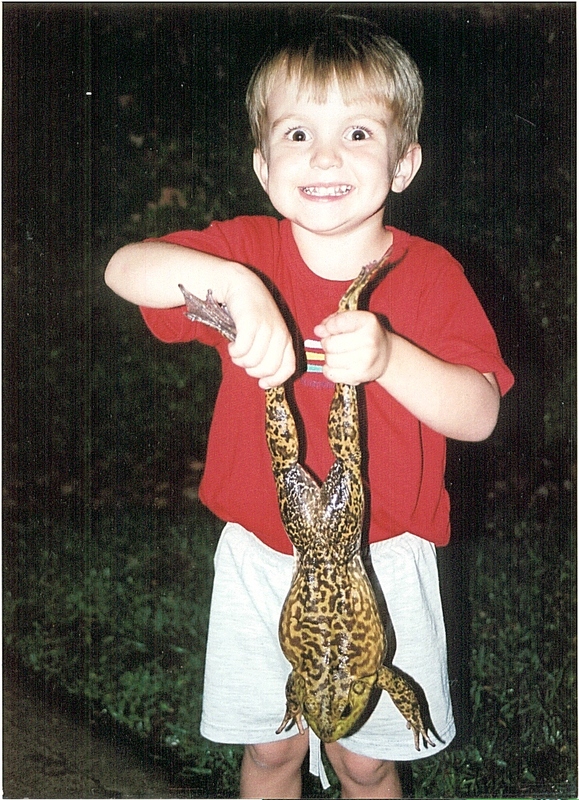 Pinning a big bullfrog to the ground while he is wildly trying to hop away can be intimidating at first, but with experience they rarely get away. There are times that they anticipate the approaching danger and leap into the water making for a fun chase through the grassy banks. The captures take a few photos and let em go for the next family night at the ditch. 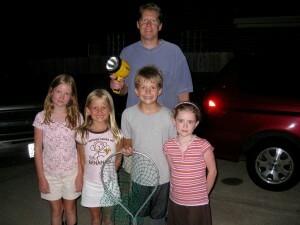 What must the neighbors think of this crazy family darting about with spotlights in the ditch. The whole adventure takes 30 – 45 minutes and the kids love bringing their wary friends on the adventure. We leave the niceties of our home and neighborhood for a brief adventure with the underground world and return safely with stories and memories that will last a lifetime. Whether you live in the country or in the middle of the city there are adventures like these, minutes if not steps from your door. Grab a light and take a few moments to explore the places others don’t go. You will find a fun adventure is just a minute away. 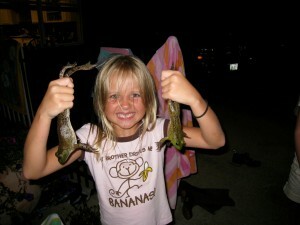 This entry was posted in Camp Applegate, Family Adventures, Meet the Applegates and tagged bull frog, camp applegate, family adventure, family memories, Frog hunting, inexpensive family outings, Jeff Applegate. Bookmark the permalink.